The PCT Church and Society Committee has noted that parishioners and pastors who are deeply committed to pursuing church growth can easily end up in arguments and disagreements because of their lack of experience or their differing perspectives. These conflicts have in turn increased the level of tension and conflict within churches. 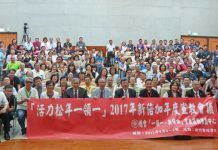 To help churches better resolve such conflicts, the committee decided to hold a seminar between May and June of 2013 in northern, central, and southern Taiwan with the goal of equipping church leaders with some conflict resolution techniques. To this end, the committee invited Brian Strom, the CEO of Canadian Institute for Conflict Resolution (CICR), to come to Taiwan and lead a seminar. 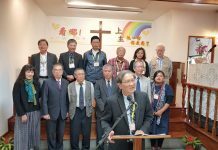 The seminar in southern Taiwan took place on May 24 at Te-Sheng Presbyterian Church in Kaohsiung and many pastors, elders, and parishioners from southern Taiwan attended the event. Strom first assigned students into small groups so that they could discuss and write down their thoughts about issues relating to conflict and the PCT’s “One-leads-One Movement”. The students were also asked to list sources and consequences of conflicts and to analyze them during their group discussion. They were also encouraged to use current affairs as discussion material. These discussions were later further dissected and analyzed by Chang Jung Christian University Conflict Study and Research Center Director Dr. Steve Chen. “What kind of barriers do churches encounter most when they pursue growth and new evangelistic strategies?” asked Strom. His question ignited a lively discussion and answers from the audience included parishioners’ fear of change, lack of spiritual maturity, conservative thinking, etc. In response to these answers, Strom said that the best way to resolve conflicts is to lead people from opposing sides away from their bias and into a safe environment where they can share openly about their misgivings with one another. In such an environment, they can then discuss how they can best satisfy each other’s needs and even conclude with a prayer. Strom suggested that the audience try these steps whenever they get into arguments about hiring pastors. He added that churches tend to think that conflicts can be resolved through prayer and the Holy Spirit, but some conflicts actually need the wisdom and expertise of professionals to reach a resolution. For his part, Steve Chen mentioned that it’s normal for people and churches to have conflicts. However, if conflicts are not adequately dealt or resolved, they will create discord in the church and in society. Unfortunately, Taiwanese people lack training in conflict resolution and most conflicts are usually eliminated through the orders of a superior or a parent. This has in turn caused many Taiwanese people to become incapable of dealing with conflicts and it has also hampered Taiwanese society from attaining justice and righteousness. PCT General Assembly Church and Society Committee Secretary Huang Che-yen remarked that Taiwanese churches have split up in the past because of people’s inability to resolve conflicts. He hopes that this seminar will help pastors and parishioners to find a variety of healthier means to resolve conflicts that will also foster growth. He also underscored that churches should be peacemakers and not dividers in the current polarized political climate. He is confident that more training in conflict resolution will help churches and Taiwanese society to find better alternatives and become a blessing to the country. Steve Chen talks about resolving conflicts before they create discord.